On the occasion of winning the election for President of the European Chess Union, President of Georgia Mr. Giorgi Margvelashvili, and the Prime Minister of Georgia Mr. Irakli Gharibashvili congratulated Mr. Zurab Azmaiparashvili. I would like to express my sincere congratulations to your victory at the presidential election of the European Chess Union. I want to congratulate this important phenomenon to Georgian Chess players, our citizens, as well as the European chess fans. I am sure that international community made a right decision by electing such a worthy person as the leader of the European Chess Union. On the other side, you deserved this honor and responsibility by hard work and warm attitude towards your business. I believe that your efforts will be fruitful for the development of sports infrastructure and chess popularization in Georgia and in Europe. Once again, I wish you success, health and happiness. I would like to express my sincere congratulations to your victory at the presidential election of the European Chess Union. You, First Deputy Minister of Sport and Youth Affairs of Georgia, are the first person in the Sport’s History of Georgia who achieved high rank position at the international sport arena. It is a very important phenomenon in our country’s sport life. It is very pleasant, that you will be the head of such an influential sport union in the world. 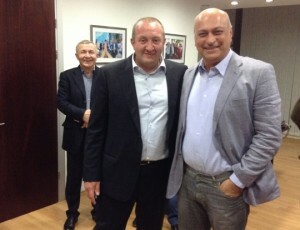 Dear Zurab, I wish you courage and success.